Human men aren’t the only ones to show off for the ladies. In fact, their stabs at romance seem a bit shabby when compared to the courtship displays bowerbirds put on for females they are trying to charm. But that’s not all – it turns out that bowerbirds are very particular about the type and arrangement of objects they place in and around their bowers. Apparently, female satin bowerbirds prefer the color blue, which is perhaps why they have evolved such strikingly blue eyes (see picture below) so the males seek out blue objects over those of other colors. 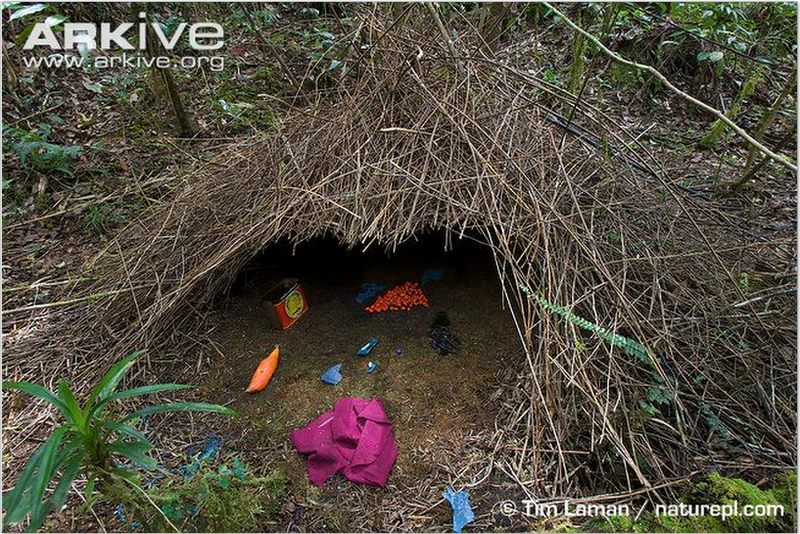 Furthermore, male bowerbirds construct their bowers to create an optical illusion. Objects are not randomly placed around their court, but instead placed in a size gradient with smaller objects closer to the entrance of the bachelor pad and larger objects farther away. This optical illusion is called forced perspective, and causes all of the objects to look the same size while the entrance of the bower appears smaller than it actually is. 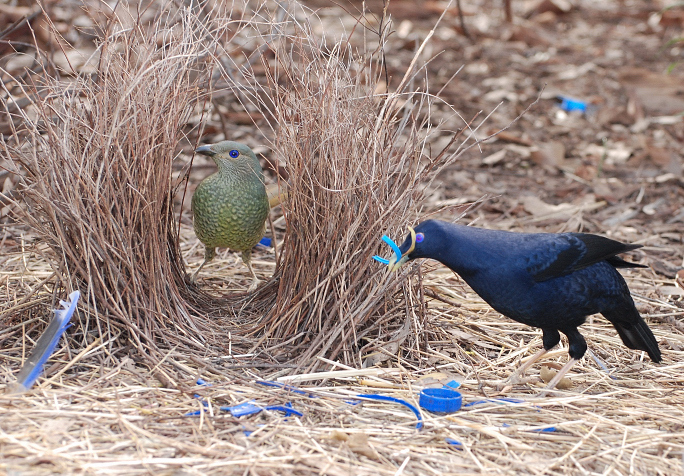 How does this help the male bowerbird snag a female? If the bower entrance looks smaller than it is, then the male hopping and dancing around the bower entrance in his courtship display will appear larger than he actually is! Males are very specific about constructing this optical illusion and will in fact recreate it in three days if it is disturbed. Perhaps we humans should take a leaf out of the bowerbird’s book – I’m sure the ladies wouldn’t complain! Photographs from Arkive site: http://www.arkive.org/vogelkop-bowerbird/amblyornis-inornata/image-G66592.html. Satin bowerbird picture from Wikimedia commons is under a Creative Commons license. Arkive pictures may be reproduced for educational, scientific, or conservation purposes. This entry was posted in Animal Romance and tagged Animals, Birds, Bower, Bowerbirds, Forced Perspective, Nature, Optical Illusion, Romance by elenasuglia. Bookmark the permalink.